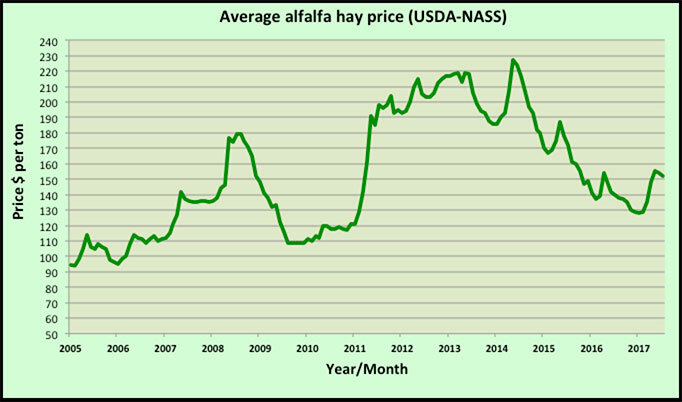 Both the all-hay and alfalfa hay price declined by $2 per ton during July while hay other than alfalfa moved from $125 to $126 per ton, according to USDA’s most recent Agricultural Prices report released last week. The June prices for both all hay and alfalfa were adjusted upward by $2 per ton since last month’s report. The all-hay price for July was pegged at $143 per ton, which was $15 higher than July 2016. The July alfalfa hay price was $152 per ton, $14 per ton over the 2016 level. The alfalfa price remains $24 above the low of $128 per ton set in January. The leading alfalfa price gainers in July were Pennsylvania (plus $33 per ton), Oregon (plus $25), and Idaho (plus $10). Ohio saw a price drop of minus $20, followed by North Dakota (minus $18), New York (minus $16), and Michigan (minus $15). 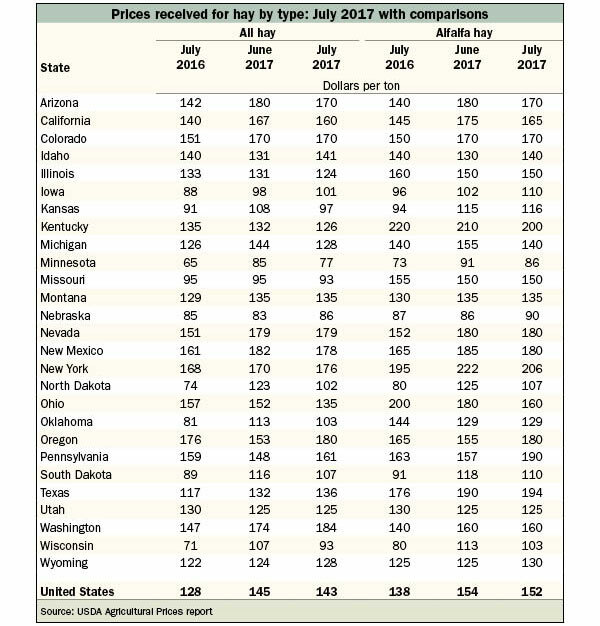 The highest alfalfa hay prices are being reported from New York ($206 per ton), Kentucky ($200 per ton), Texas ($194 per ton), and Pennsylvania ($190 per ton). The lowest prices can be found in Minnesota ($86 per ton), Nebraska ($90 per ton), and Wisconsin ($103 per ton).